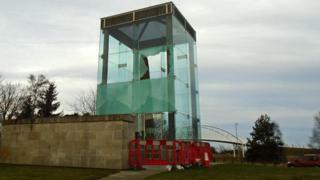 Vandals have caused more than £10,000 worth of damage to glass panels which surround a medieval stone in Moray. Three panels at Sueno's Stone at Forres, between the B9011 and the A96, were broken on Wednesday night. The early medieval period carved standing stone is more than 20ft tall. Police Scotland said: "It is disappointing for the community that this has happened and this type of behaviour will not be tolerated." A spokesperson for Historic Environment Scotland said: "A member of our staff inspected the site on Wednesday, so we know this vandalism must have occurred on Wednesday night. "We are pleased to say that the monument itself doesn't appear to have been damaged, but it may take some time to replace the protective glazing protecting it, which was seriously damaged. "Our conservation staff have been working alongside counterparts from Moray Council today, in order to make the site as safe as possible. "Damage to such a nationally important monument is a criminal offence and we will provide any assistance we can to help Police Scotland with their inquiries."